You may have heard something about me. You may have heard that I happened this last Saturday. Lots of people were talking about me, which was great – I was a little worried because all of this talk about my arch-nemesis, basketball, going around. I'm not used to sharing the April spotlight. I know it was a bit cold and windy, and I'm not that exciting to watch, but I really do appreciate everyone for coming out to see me. I raised a bunch of money for the C.S. Mott Children's Hospital, so that was awesome! Hopefully everyone had a great time. So what was so great about me? I've asked Brad to put together a bullet-style list for you. Enjoy! • The defense showed up to play today. I was extremely impressed with the DL and the play of Frank Clark and young guys like Ondre Pipkins and Taco Charlton. We're young all over on defense, but oddly experienced in key areas. And depth, don't get me started. We has it. The defense as whole was impressive even without Jake Ryan, who watched on from the sideline with crutches. As I'm sure you've heard by now, Hoke thinks Ryan could be back by mid-October. 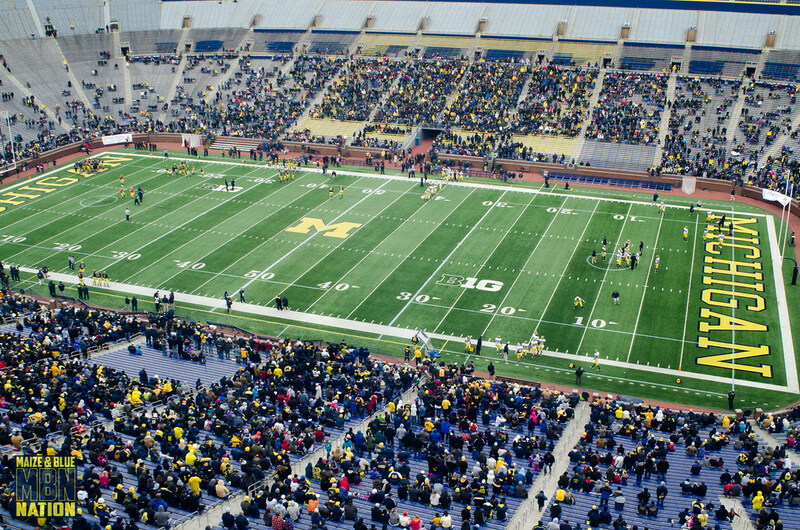 For Hoke to come out and say that is huge. Brady Hoke is not the kind of coach to open up like that. Remember, this a guy who love to use the term "boo-boo" when referring to a player's injury. With this new information, we could actually see Ryan back even sooner than that, given that Hoke was probably being conservative in his estimate...I hope. Filling in for Ryan were guys like Gordon and Beyer. I think Cam has the edge here simply based on his explosiveness and overall athletic ability. Maybe the senior just wants it more. Definitely a good position battle though. • James Ross looks like the real deal. He'll be a starter this fall. Desmond Morgan also looked great. I'd say the linebacker position is solid. • Secondary is also looking great with Thomas Gordon at the strong safety spot vacated by Kovacs. I assume Blake Countess will start when he returns to active-duty this summer. Either way, I think Taylor and Avery looked fine on Saturday. Marvin Robinson and Jarrod Wilson fighting it out for the other safety spot is a great position battle that could last until August 31st. • Greg Mattison said on BTN's coverage that he wants a legit 4-man pass rush. I don't think he has it just yet, but it's getting there. The trademark of a Mattision defense is blitzing. He won't abandon it...but I see his desire to not want to rely on it too much. If he can get it by the Big Ten season though, watch out. Book your tickets for Indy in December. • Devin had about as great of a day as you could expect. He's historically struggled in spring games, so to see him look calm, composed and in-charge of this offense was reassuring. Not that I expected any less. His arm looks terrific. He was slinging the ball great, and finding receivers/TEs with relative ease. He looks like a starting QB. He's ready to take that step and be the man. But it's clear that we need Shane Morris to arrive and slip into that backup spot quickly. It's not that Cleary did anything wrong...hell, he might have been the starter in 2008. But this offense needs a more proven playmaker to lead it. With Devin, that's not a problem. But after him, it's a big drop off. And that's a little scary. • I don't think Fitz lost his starting spot despite not playing Saturday. Although, I do like the competition for the backup spot. I think you could easily go with Rawls, Johnson or Hayes...all 3 looked pretty good...although Rawls made some better runs. Dennis Norfleet is best served as a specialist right now. He runs great and has tremendous speed, but the competition for RB is fierce. I think he could make a better name for himself as a returner...plus he'll get more playing-time that way. And not to mention, incoming-freshman Derrick Green will arrive this summer. No telling that that will do the RB position. I'm not worried one bit. • The line looked good. I think the young interior guys played well, and will only get better the more they practice and prepare. I think we're in a good spot with Kalis-Miller-Braden. I didn't see anything on Saturday that made me worry. These guys look big and tough and they play like it too. With senior tackles leading the way, I think this group is in great hands. • I think Devin Gardner likes these receivers. Sure, we could use a guy like Braylon Edwards (who couldn't? ), but this group of receivers can work for this offense. I also think Devin Funchess adds a huge dimension to the passing game. I could easily see him being Gardner's favorite target once the season begins (sorry Gallon). But yes, Gallon and Dileo are still very important to this team and this offense. I was impressed with Chesson and Darboh. I think a lot is expected from these guys in 2013, and I think they're both capable of delivering. One or both of them will have a breakout season this year, mark my words.